The word "budget" has the power to make a lot of people panic, as it has a reputation for being both tedious and challenging. 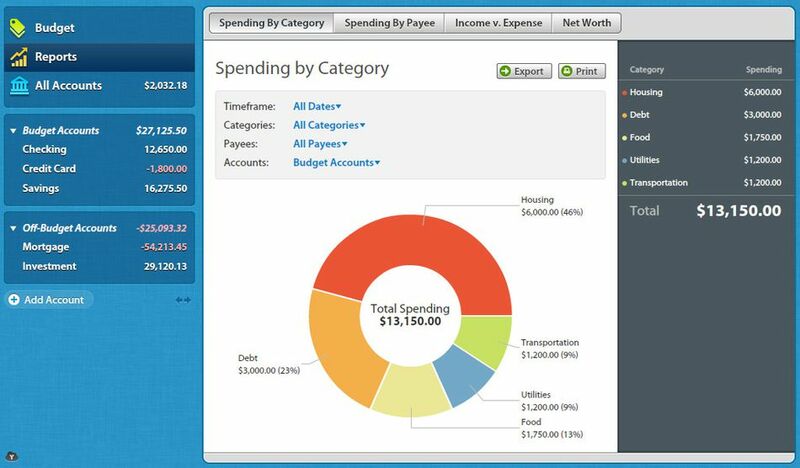 Personal budget software apps can take the tedium and the challenge out of the budgeting process. They can help you create and stick to a spending plan, and many come with handy extra features depending on your needs. Affectionately known as YNAB, You Need a Budget is an extremely popular personal finance app. The current version of YNAB packs in many features and improvements over earlier versions, and it intuitively teaches some solid budgeting practices. It runs on both Windows and Mac and it backs up data automatically. Budgets can be shared among multiple users. It might be one of the easiest apps out there as it was designed for budgeting beginners. If you've tried to budget in the past and failed, this could be the app that you need. If you need help, you can sign up for classes with a live instructor. Failure is less of an option because the app comes with an "accountability partner" that will wave a red flag if you stray from the budget you've created. YNAB is a browser-based program, but it also offers Android and iPhone apps that sync data to your desktop. As of November 2018, it is $6.99 a month. Mvelopes is a fully featured online personal finance app that's based on the old "envelope budgeting" premise—put your cash in envelopes, mark the envelope as to what the cash is for, and when it is gone, it is gone, resetting during the start of your next pay period. You're not supposed to borrow from the "grocery" envelope when your "clothing" envelope is depleted. Mvelopes just makes your envelopes digital. When your envelope is empty, the app will light it up in red. Mvelopes includes mobile apps for Android and iPhone, and you can sync to all your bank and credit accounts. You can choose from three versions depending on your budgeting needs and expertise: Mvelopes, Mvelopes Coaching, and Mvelopes Premier. The first is free, but the other two are subscription-based. The Plus is $19 a month, and the Complete is $59 a month. No list of personal finance and budgeting apps is complete without mention of Quicken, and with good reason. This app almost predates the computer age—it has been around in one version or another since 1983. That said, it is a bit old-fashioned in some ways. It set the standard so it does all the basic things you'd expect a budgeting app to do, and it does them well. Depending on the version of Quicken that best meets your needs, you'll spend anywhere from about $35 to $60 as of November 2018. There are limited versions for Mac, and you will not be given the option to Quicken's most powerful version, Home and Business. Mint is a well-known and popular app, and it shares several similar features with Quicken. Intuit once owned Quicken, then it purchased Mint in 2009—thus the similarities. But Mint is different from Quicken in an important way: it is free. This means you will have to deal with a lot of ads, but you will get almost all the same integral features you would get with any other app. It allows you to connect with your bank and lenders, it sends you alerts when bills are due, and the interface is clean and easy to understand. It does not nail your budget down to every precious dime, so you have some flexibility. An oft-heard complaint is that Mint "decides" some aspects of your budget for you, such as how much you can/should spend on entertainment based on your income. But you can override these entries and create your own limits and categories. CountAbout is browser-based and offers two versions: Basic, which is most appropriate for budgeting novices, and Premium, which has more in-depth features. The first costs about $10 a year as of 2017 and Premium will run you about $40 a year. If you want an app that automatically connects to your financial institutions and downloads your transactions, go with the Premium version. It provides connections to over 12,000 banks, lenders, and brokerages. The basic version allows you to import your transactions from other sites, but you'll have to update it manually. If you migrate from Mint or Quicken, CountAbout allows for you to import your data directly, which saves a lot of time. This app is essentially a Quicken app for Mac users. It does everything that Quicken and many other apps do, helping you to set up a budget and sounding alarms when bills are coming due. It lets you make charts and graphs to help track your spending. The homepage is a comprehensive snapshot of your current financial situation. It also does a couple things that not all personal finance budgeting apps offer. Money Dance keeps track of your investments, and it alerts you to monthly changes in your net worth. It may not be appropriate for budgeting beginners, but it has a lot to offer for more experienced personal money managers. The price as of November 2018 is $49.99. A software app, Personal Capital is pretty popular and offers a lot of features that make it a good choice for just about anyone. It is a budgeting tool that lets you import transactions from your various accounts, just like most others. Unfortunately, it doesn't let you create your own budget categories. You're stuck with the list the app provides. After you understand how to navigate the site, you can create numerous charts for both spending and savings, comparing your budget from one week or one month to the next. This app is very well suited to those who want to grow their wealth. It keeps track of your net worth and it includes investing tools that will allow you to monitor the Dow Jones and S&P 500, as well as related fluctuations in your personal holdings. It even tracks fees you pay to brokers and will tap you on the shoulder if it begins to appear that you might want to bail on a particular investment and think about putting your money elsewhere. Surprisingly, this app is free, although you can purchase a premium version for more personalized care. Acorns is more like a wise, protective parent than a budgeting app. It is pretty unique. It literally saves and invests your spare change for you. This app tracks your credit and debit card purchases and rounds them up to the nearest dollar, then it invests the difference for you in safe exchange-traded funds in one of five ready-made portfolios that you can select. If you spend $69.20 at the grocery store, Acorns will automatically divert $0.80 to your ETFs. You probably won't miss the money and you won't even have to drain your savings to maintain the app. It only costs $1 a month until your portfolio hits $5,000, then it costs 0.25 percent of your balance. If you happen to be a college student, it is free. Contrast that to the $30 to $180 a month that Acorns claims to save for each subscriber. You are not limited to investing just those "round-ups" either. You can invest other money through the app as well, up to $30,000 lump sums. Acorns is web-based and is also available for iPhone and Android. Numerous apps will help you budget. What sets one apart from another depends on what you're looking for in a personal finance budgeting application. There's something out there for virtually every financial goal.